Converse sneakers are loved by everyone and are super universal, lots of fashionistas and celebrities have already proved to us that you can wear these sneakers with anything. Let’s have a look at the freshest ideas to wear Converse this spring with various outfits. Jeans and Converse seem to be created for each other! 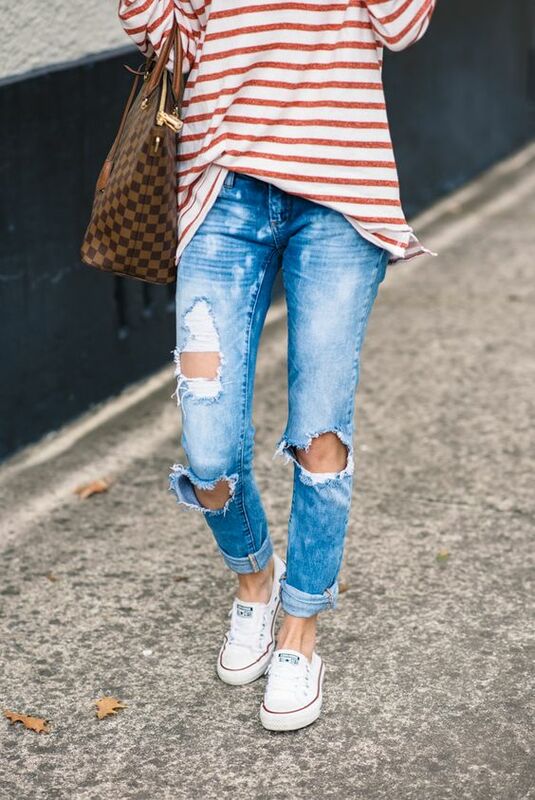 You can wear any jeans with any Converse and you will always look awesome! Black, blue and white jeans, distressed or not, red, white, black, navy or any other Converse – you just need a tee or shirt of your choice, and a great casual look is done! Pay attention to the off the shoulder tops, they are super trendy today. You can also wear a cardigan or a jacket if it’s cold. Try skater skirts as they look with Converse the best way possible. A dress with an symmetric skirt will be also to the point here, and if you want a contrast, just a floral midi dress, a leather jacket and Converse. Another contrasting look is a white lace dress, a denim jacket and white Converse – romantic but rock! Get inspired!